The more one studies the teachings of the esoteric, the more one sees esoteric truth hidden with symbolism in religious scripture. 1 Samuel 17 illustrates such symbolism. In this story in which most of the Western world is familiar, we see the tale of the young David victorious over the militant might of the giant Goliath. The Bible is rich with simple fables that illustrate a hidden truth than what the ordinary reader perceives: only the initiate of the mystery schools sees the hidden message. The reason most only see the literal interpretation of scriptural events is due to the conditioning of the Church: the truth is reserved for the initiate – the parable for the simple commoner. There is much more to this story than what most believe. In the first book of Samuel is written the tale of the young (not yet King) David confronting the renowned Philistine warrior Goliath. The warrior, standing tall over other men is described as a giant among men and possessing great strength. In contrast, the boy David was small and meek; yet overcomes the Goliath and triumphs over the enemy. 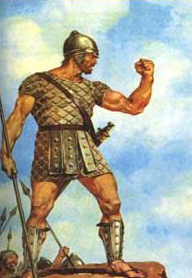 Goliath represents the worldly man: the lower nature that is thirsty for conquest. Violent, strong, material and dominating, Goliath pursues only the material world and its glory and riches: overcoming any obstacle in his way by force and violence. The way of Goliath can only end in misery – as the material world is transient: ever changing and unsatisfying. We see this mentality in government and business today: endless war and conflict, often for financial gain – an endless cycle. David represents the soul: meek yet wise. A quiet strength that comes from within – the Master within. As mentioned in the scripture, David took five smooth stones. This is symbolic of the five senses that have been disciplined and purified: a process that results in control of the mind and body via personal spiritual growth – alchemy. One of these stones was thrown and targeted the seat of consciousness on the Goliath, killing the lower animal nature and defeating it. 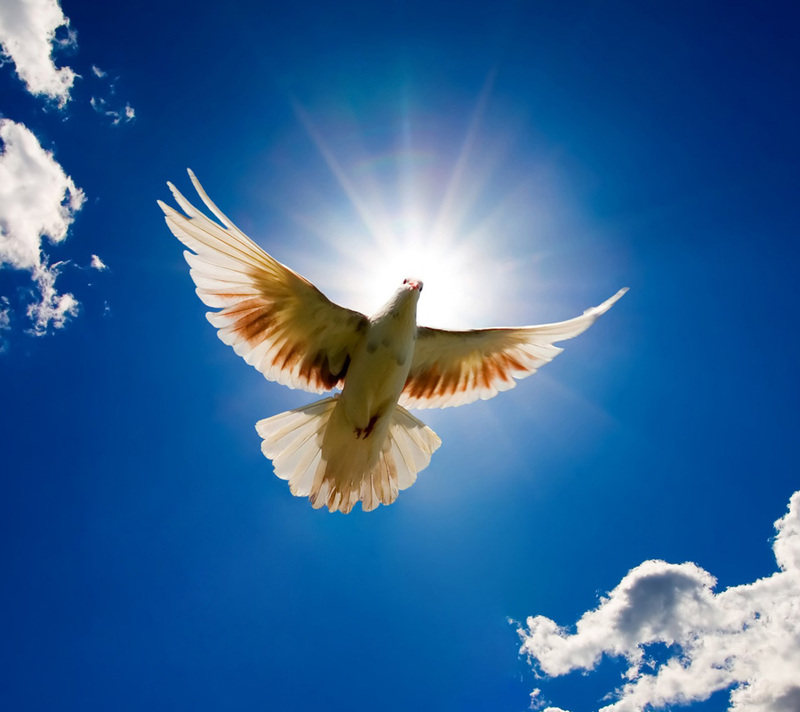 The soul is now triumphant over the lower man: liberated. This is the journey of all of us in this world: to overcome the lower nature with our higher consciousness – our true spiritual self. This is not without battle as the lower self resists with all of its might and cunning. It is meditation and spiritual communion with the Divine that is the single effective means of contacting the Master within so that it can eventually manifest in this world over the lower beast. 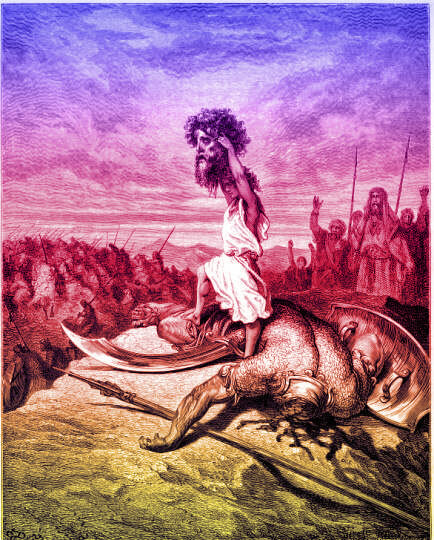 This entry was posted in Metaphysics & Esoteric, Religion and tagged Bible symbolism, David and Goliath. Bookmark the permalink.